Marvel’s Spider-Man Fantastic Four suits are finally here! After a sneaky tease from Marvel, and then a week of Fantastic Four events and celebrations, PS4 players are finally getting in on the action. Update 1.14 is now live for all players, and it unlocks the “Bombastic Bag-Man” suit and “Future Foundation” suit. Oh, and both suits are completely free for everyone. 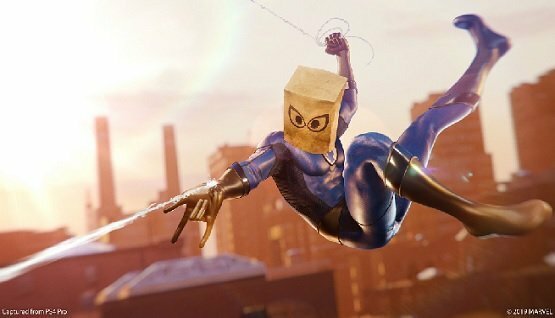 The Bombastic Bag-Man suit, seen above, is inspired from a comic story that saw Peter Parker coming to the Fantastic Four for help. His body was being taken over by the symbiote that would eventually become Venom, and he needed their help getting it off. The Future Foundation suit looks a little more intimidating, to be sure, but it’s not going to be nearly as entertaining to watch during narrative cut-scenes. If you’re wondering, neither suit has its own dedicated suit power, so you’re free to mix and match any of your previously unlocked suit powers as you wish. Don’t forget that the infamous Raimi Suit is also available, along with some incredible new DLC suits.